I'm already well into week 9. I have wanted to post much more that I have been able to. I want to update everyone on how my DietPower software is working. I just got my bike back from the shop with some new brakes. I tried out my new bike shoes for the first time. There is just too much to mention right now. Hopefully I can get caught up this week. Monday: Ran 60 minutes at mostly 5 mph, totaling 4.7 miles. Tuesday: I had to skip the morning swim, but in the evening I took a spin class and road for 69 minutes, keeping my HR in the range of 140-150 bpm. It was very rough, but I surprised myself by sticking it out for the whole class. 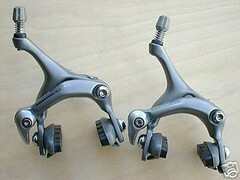 I bought a second hand set of Shimano 600 dual pivot brakes for my bike off of eBay. I am very large, so I can really use the extra breaking power. Wednesday: I ran intervals for 60 minutes, totaling 4.17 miles. Maximum speed was 6.2 mph. Thursday: Swam an incredible 2000 meters. 400 meter warm-up, 400 meter slow and straight through, 8x50 meter sprints, another 400 meter slow and straight and a 400 meter cool down. In the evening I took another spin class for 60 minutes. Friday: Slow run for 60 minutes, totaling 4.2 miles. I received my order from Tri-Sports.com which includes a new saddle and a pair of bike shoes. I cannot wait to try out the new saddle. Perhaps I will this Saturday. 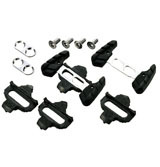 I also ordered some SPD cleats from bikeparts.com that have rubber pontoons on the side. As you can see from the photo, they attach to the cleat and allow you to walk on the cleat without putting holes in the floor or destroying your cleats. I also tried my hand at installing the new brakes I got off of eBay, but I just made a mess of things. Time to take the bike to the shop! Saturday: Since my bike was not operational, I took a spin class. I went for 60 minutes even though the class was only 50 minutes long, but I couldn't go for two whole hours like I originally planned. I justify that by the fact that the spin class is actually harder than riding a bike on the street, because I push myself harder and do not coast. Another reason to take a spin class is that I could practice using my new bike shoes. 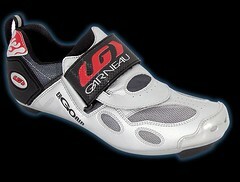 I purchased a pair of Louis Garneau Tri-Airs. They seem to fit really well, because I have wide feet. Engaging the pedals was easy enough and everything was going fine. I noticed that the shoes help you to distribute the load over more of the pedal spin and they were very comfortable. Usually when taking a spin class in sneakers I get numb feet. I did have a problem getting off the bike at the end of the class. One of the screws attaching the cleat to my right shoe came off. I guess I did not have it torqued down enough. With only one other screw holding the cleat on to the shoe, it could rotate fully and wouldn't let me disengage from the pedal. It was pretty embarrassing. I had to strap out of the shoe and then try to find some tools to wrench open the pedal to get my shoe off. Well, I learned my lesson. Thank goodness i was not on a real bike, or I could have had a bad tumble. Sunday: Did another 2000 meters in the morning using the same routine as on Thursday. In the evening I ran around the neighborhood for 4.2 miles. For next week, I will have the same schedule planned, except that I took a rest on Monday.